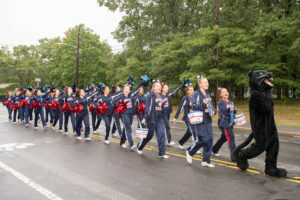 Miller Place High School recently held its annual homecoming parade and football game to celebrate the spirit and excitement of the Miller Place community. The parade featured student-designed and decorated floats recreating different biomes from around the world. 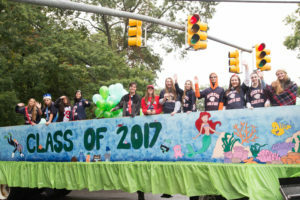 The senior class designed an ocean-themed float, the junior class designed a rainforest-themed float, the sophomore class designed an arctic-themed float and the freshman class designed a desert-themed float. The senior class was named the winners of a competition between the grades for the most innovative homecoming float, best hallway decorations, displaying the most class spirit, the most fundraising and collected the most goods for a food and goods drive. As the first place recipients, the senior class received $500 in prize money from the Student Council funds. During the homecoming festivities, each class also worked to raise money for Make-A-Wish Foundation, collecting more than $3,500 by the day’s end. Miller Place High School cheerleaders and the Miller Place High School Panther mascot lead the 2016 Homecoming parade. Students from each class, the Miller Place High School pep band, the Miller Place Volunteer Fire Department and members of the community also marched in this year’s parade. The senior class rides on their ocean-themed float through the streets of Miller Place during the District’s annual homecoming parade. The senior class was named the winners of a competition between the grades for the most innovative homecoming float, best hallway decorations, displaying the most class spirit, the most fundraising and collected the most goods for a food and goods drive. As the first place recipients, the senior class received $500 in prize money from the Student Council funds.